Royal Challengers Bangalore 3-187 (Saurabh Tiwary 52, AB de Villiers 50*, Ashok Dinda 2-52) beat Pune Warriors 9-170 (Robin Uthappa 75, Angelo Mathews 32, Vinay Kumar 3-31) by 17 runs. Royal Challengers Bangalore hammered 187 after losing just three wickets in the allocated 20 overs and Pune Warriors scored 170 with one wicket remaining at the end of the game. AB de Villiers (Royal Challengers Bangalore) was declared ‘Player of the match’ for his brave unbeaten knock of 50 from 23 mere balls. The 46th match of the Indian Premier League was held on Thursday, May 2, 2013, at Subrata Roy Sahara Stadium, Pune. Earlier, Virat Kohli, the skipper of Royal Challengers Bangalore, won the toss and wanted the rival team to chase. Saurabh Tiwary and Chris Gayle entered the field with their willows and scored just 23 runs in the initial five overs with a couple of fours from the latter. The first wicket fell at 36 when Gayle was gone for 21 and was replaced by Virat Kohli who started off slowly as Tiwary hit 1 six and 1 four in the 9th over. Kohli exhibited his presence by hitting 3 fours in the 11th over but was clean bowled by Ashok Dinda for 25. AB de Villiers got together with Saurabh Tiwary who attained his fifty in the 14th over and became the third victim at 119 in 15.1 overs for 52 off 45 with 2 sixes and even fours. Moises Henriques associated with de Villiers and they gathered 1 six and 5 fours in the following overs. 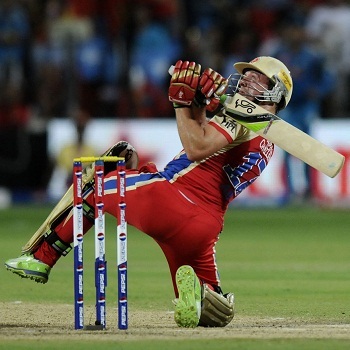 AB de Villiers was severe on Dinda in the final over by accumulating 26 runs with 2 big sixes and 3 fours. He remained unbeaten for 50 off just 23 deliveries with 2 sixes and 6 fours, Henriques occupied his end at 27 from 13 as Royal Challengers Bangalore rushed to 187 with seven wickets remaining at the end of the 20th over. Ashok Dinda was the top wicket taker with two whereas Tirumalasetti Suman claimed one. Robin Uthappa along with his captain, Aaron Finch, opened the innings for Pune Warriors and the latter surrendered for 15. The top order batsmen struggled mostly and the entire burden of batting was carried on by Uthappa. Yuvraj Singh tried to escalate the innings with Uthappa and they hit 3 sixes and 1 four in two overs. Yuvraj Singh was caught by de Villiers at long on at the bowling of Vinay Kumar for 16 and the home side was struggling at 4-81 in 10.5 overs. Angelo Mathews joined in with Uthappa who was playing excellently at the other end. Robin Uthappa smashed his half century in the 15th over with 1 six and 1 four and the duo punished Muttiah Muralitharan for 21 runs in the 16th over that comprised 3 huge sixes. Things started looking bright for the hosts as they required 45 runs to win the game in 24 balls when Mathews was caught by Gayle at point off Vinay Kumar for 32 off 19 with 3 sixes. Robin Uthappa was the seventh batsman who returned to the pavilion for 75 from just 45 balls with 5 towering sixes and even fours. Pune Warriors managed 170 for the loss of 9 wickets as the required quota of overs came to an end. Vinay Kumar was the star performer with three wickets, Murali Kartik held two whereas RP Singh, Moises Henriques and Chris Gayle shared one wicket each. 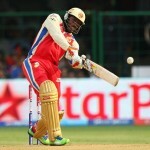 Royal Challengers Bangalore won the encounter by 17 runs and jumped to the second position on the chart with 14 points.